MIAMI, FL – From the intro electric guitar riffs that kick off the opening track of his new CD, Living the Dream, which is due out June 12 on Blues Leaf Records, blues guitarist/singer Albert Castiglia announces that this release is something special. And throughout the rest of this impressive new album from the guitar master and former band leader for the legendary Junior Wells, Albert Castiglia delivers big time on the promising steps he’s taken on his previous CDs. Living the Dream sports an even-dozen tracks dripping with soulful, searing blues, the product of his energetic guitar work - alternatively pensive and reflective, then filled with sparks and fire – melding with a vocal style that pays tribute to the masters, but clearly stamped with Castiglia’s own, inimitable sound. Included are five Albert Castiglia originals, plus a song from long-time cohort Graham Wood Drout (Iko-Iko), along with distinctive covers of tunes from artists such as Freddie King (“Freddie’s Boogie”), Little Richard (“Directly from My Heart to You”), Paul Butterfield (“Lovin Cup”) and Mose Allison (“Parchman Farm”). Living the Dream was produced by Ben Elliott, recorded at Showplace Studios in Dover, New Jersey, and features backing by Albert’s regular band of Bob Amsel on drums and A.J. Kelly on bass. Special guests include John Ginty on keyboards, Sandy Mack on harmonica (who also played on Albert’s last CD), Juke Joint Johnny Rizzo on acoustic slide guitar, with Emedin Rivera once again adding his special Mojo on percussion. Castiglia toured with Atlanta blues singer Sandra Hall. His 2008 CD, These are the Days, contained five original Albert Castiglia songs, including the opening track, “Bad Year Blues,” which was nominated for song of the year at the Blues Music Awards, and “Godfather of the Blues,” his tribute to Junior Wells. Once again, Graham Wood Drout contributed another song for Albert, “Celebration.” The cover songs on These are the Days saluted a wide range of styles and artists ranging from Bob Dylan (“Catfish”) and Nappy Brown (“Night Time is the Right Time”), to Fenton Robinson (“Somebody Loan me a Dime”) and Little Willie John (“Need Your Love So Bad”). 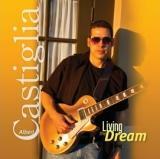 Albert Castiglia is supporting the release of Living the Dream with extensive touring both in his home state of Florida and throughout the rest of the country. For more information, visit www.albertcastiglia.com and www.bluesleaf.com.